In the current uproar, immigrants of the caravan are pitted against U.S. Border Patrol agents and U.S. troops. Unseen and largely ignored by the media are those who will ultimately determine the outcome; namely, the drug cartels who virtually control the entire border and most of Mexico for that matter. 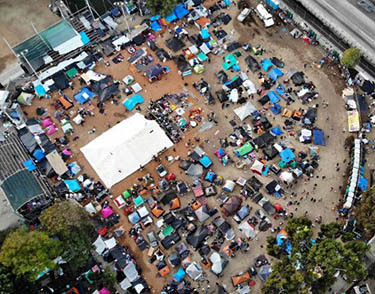 An aerial view of the temporary shelter set up for migrants in Tijuana. For this, the cartels have only themselves to blame. The caravan chose to go 1,800 miles from Mexico City to Tijuana rather than the shortest route, 660 miles to Texas, where the cartels have firm control. Better to face U.S. opposition than the unforgiving mobsters. But as always, the cartels found something to their advantage. The Border Patrol has also been drawn to the West, leaving vast stretches open to the drug invasion, and along it came. Human beings are worth something, but they don’t compare to the value of drugs, an estimated $60 billion a year in U.S. sales. Beyond the border is bountiful America, where cartel agents direct the flow of drugs to designated cities like Chicago. There gang warfare over drugs resembles the brutal clashes in Mexico. Increasingly, cartel chiefs are locating to upscale areas in the U.S. where they easily blend in with equally affluent neighbors. In the border town of Douglas, Arizona, a rancher pointed out to me the homes of recent cartel arrivals – here, here and possibly here. Patience eventually wins. The longer the caravan stays in Tijuana, the more vulnerable it becomes to the preying cartels. They will quietly sidle in to make their pitch and threat. By then, the U.S. will have moved on to other headlines, probably abroad. Mexico will be out of mind, as it usually is. The local Tijuana lawmen will not resist since they’re in the keeping of the cartels. The cartels fill a vacuum, and one by one immigrants will secretly cross somewhere on the border at the cost of a few thousand dollars each. Otherwise, they can carry drugs. If they refuse, they’re killed – the law of the border. This will not change until American drug users stop financing the cartels who have ruined Mexico and would like to do the same to the U.S.